Hands up if you are using social networking in some way in your business. Mmm…not as many of you as we thought. In fact, it’s hardly any of you. In spite of all the brouhaha over Google Buzz, the fascination with Twitter and the constant media knocking of Facebook, the fact is most Internet users don’t go anywhere near these things. There are 1.7bn users of the Internet worldwide; leaving aside the fact that’s only a quarter of the planet, there are only 350m users of Facebook and around 80m on Twitter (most of whom don’t appear to send any Tweets anyway). 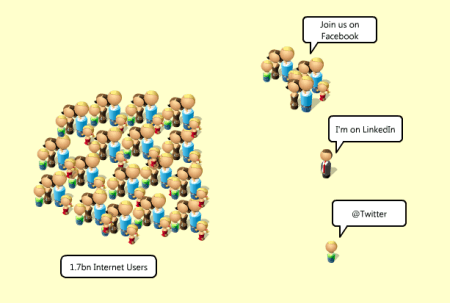 The stark truth is that most people don’t use social networks; so why all the fuss? At first sight it seems that all those business people clamouring to “make money on Facebook” or to use Twitter to create millions are looking in the wrong direction. After all, more than three quarters of Internet users are, effectively, on the “other side of the room”. To concentrate on those social networks would, it seems, be to ignore the vast majority. But that is a potentially mistaken view. Consider this; around 2% of people in the UK do not own a television, yet it’s almost certain they’ve heard of EastEnders or Coronation Street. Similarly, I was once told a story – it may or may not be true – but here goes….about a businessman on a “self-development” trip to a remote Tibetan monastery. As the monk led the group of people through the hillside to their place of meditation he heard one of the group speaking in English. The monk turned to the visitor and in faltering English said: “Ah….David Beckham”. Even without access to the trappings of the West, this monk had heard of a footballer. And with much of sub-Saharan Africa having almost no TV ownership, you can bet your last fiver that a crowd of kids would assemble around David Beckham if he were to stroll around in Malawi. So how come they know him? In the world outside the Internet, people and things made popular by TV extend into the rest of our cultural experience. Radio and newspapers report what goes on in “TV land”. Similarly, fans of Coronation Street talk about the program down the pub with their mates, some of whom have never watched an episode. The influence of TV extends beyond that screen in the corner of your lounge. The same is true now of social networking. What happens on Facebook or Twitter is made apparent to the vast majority of Internet users through word of mouth, other media and different websites. The vast majority of people online may not be social networking users, yet they are all influenced by it. In just the same way that TV advertising has the most significant influence on people (and that’s why you pay so much for it), social networking is now the prime influencer in the online world. What this means is, if you are not using social networking and social media in your business you are not operating in the sphere of influence. Chasing after the three quarters of Internet users who shun social networking is actually one of the hardest tasks you can attempt. Influencing them through social media, is so much easier. True, most Internet users do not go near social networking sites; but all of them are influenced by them in some way. It’s therefore essential for your business to get engaged with social networking if you wish to have influence on your marketplace. It’s either that, or stump up millions for those influential TV adverts. Or perhaps simply play football like David Beckham.